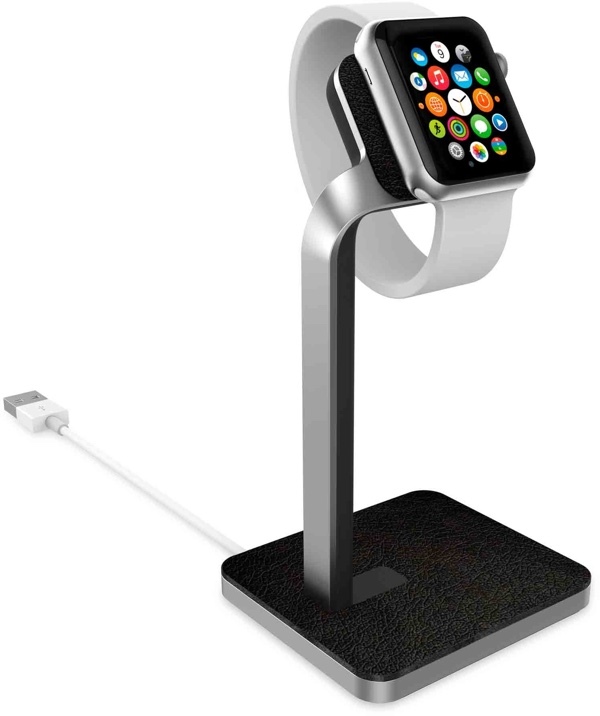 While the release of the Apple Watch has seen a boom in third-party docks and stands for the device, those accessories have needed the stock charger that Apple supplies to charge the Apple Watch. However, Apple will soon allow manufacturers to make official third-party Apple Watch docks and stands with integrated chargers, according to 9to5Mac. The change is coming for manufacturers in Apple's Made for Apple Watch program, which is similar to the Made for iPhone/iPod/iPad program, known more simply as the MFi program. This will allow manufacturers to obtain the charging pad at the end of the Apple Watch charging cable so that they can install them in their dock and stand accessories. Previously, users had to insert their own charging cables into third-party stands and docks, making those products a little complicated to set up. However, the charging components are currently only available in "sample quantities" and official plans for accessories with integrated chargers cannot be submitted for approval. It's unknown when the first Apple Watch docks and stands with integrated chargers will be available. I still don't get the appeal of the apple watch. I really don't see it as a must have device at all. I have zero desire for one. But that's me. Then it's not for you. Plenty of people get a lot of use out of it. I applaud the move but I think Apple should make a first party Nightstand-friendly stand of its own. No. It's more clutter because it's an additional object that's physically present on your nightstand. But it might use less real-estate - I'll give you that. But how does this new "Nightstand Mode" in watch OS2 figure into it? The watch needs to be on it's side and quite stable so you can, bleary-eyed, and with impaired fine motor skill, whack the crown straight DOWN to see the time at 4 AM. Actually nightstand mode turns on at the slightest of movements of the watch. In fact all I do is lightly tap my bedside table and the time is displayed... It is and extremely useful feature and also the friends button is now the off button for the alarm whilst the crown is the snooze button. Thank god. I was afraid that this would be an Apple Watch thread without this comment in it. Seriously, who cares? What compells people to go in threads about products and say that they don't need one? What does it add? I guess I will go now to the Procter and Gamble forums and post why I don't need tampons. Wtf does that have to do with Apple certifying a new accessory type?????! Why don't you go go post your off-topic comment on the "iPod factory reset help" thread or somewhere else equally retarded while you're at it? So you're the guy that does that! Unmasked at last! Apple should go out of business. Your response has nothing to do with the topic of this thread. Just why did you feel it necessary to make your post? No one really cares that you don't like the watch! Please take your don't like comment to the "don't like" thread. Thanks.